Caribbean Lifestyle Media: The internet was buzzing late last night with talk of "who is who", we learned early on that Mavado would be performing at Liv Up stage show-West Kingston Jamboree. 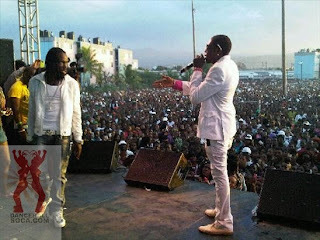 Well it is official Kartel and Mavado ended their feud on stage for the world to see. 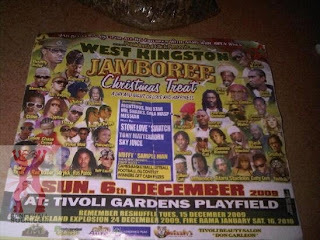 Jamboree was held at the Tivoli Gardens Playfield. We learned that this truce was brought together by Christopher 'Dudus' Coke. The Alliance camp shared: "That was a moment anyone who was there will neva forget. big up to Dudus for makin it happen. many tried and failed, he made it happen". Mavado and the Alliance manager, Jullian Griffith is scheduled to meet with Jamaica's Prime Minister Bruce Golding on Tuesday to discuss ways to move forward after this historical event in Dancehall music. 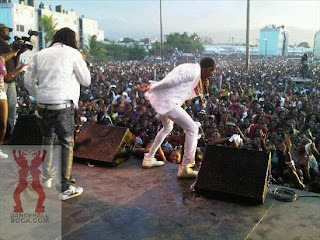 It was stated by the Alliance camp that while Bounty Killa supports the Gaza/Gully peace, he has unresolved issues with Vybz Kartel that will need to be worked out.